Authors: Daniel Leff, Pratik Sufi, and Dugal Heath. 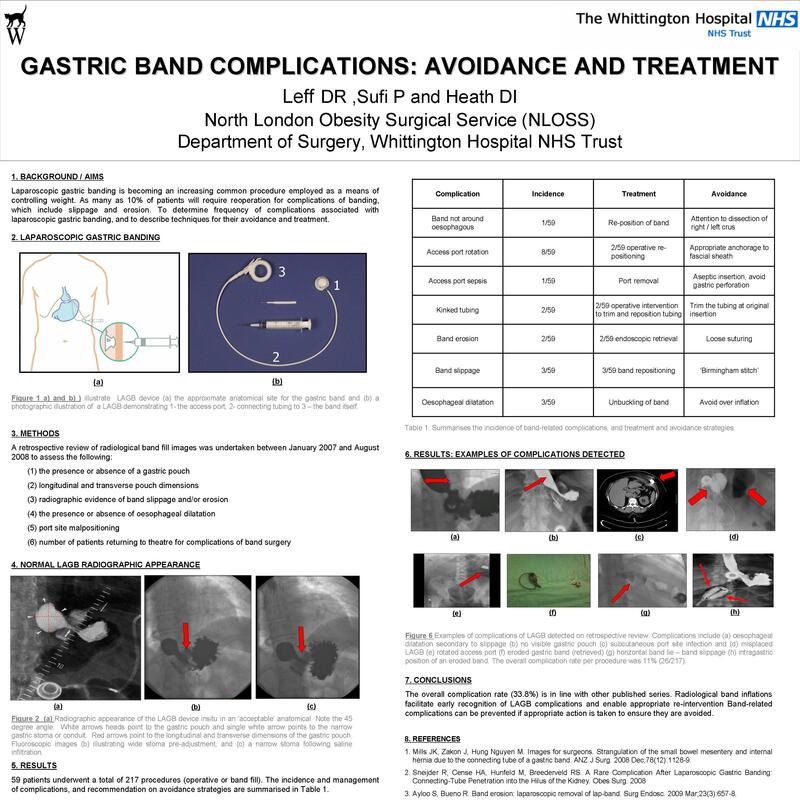 Objectives: To determine frequency of complications associated with laparoscopic gastric banding, and to describe techniques for their avoidance and treatment. Results: 59 patients underwent a total of 217 procedures (operative and/or band fill). The band was not around the oesophagous in one patient and required re-positioning (avoided by careful attention to right and left crus dissection) 8 patients suffered access port rotation, of which 2 patients required re-positioning (avoided by anchorage to fascial sheath). 1 patient required port removal due to local sepsis (avoided by careful asepsis at insertion and avoided gastric perforation). The badn tubing was strangulated in 2 patients, both requiring re-intervention to trim the tubing (avoided by trimming tubing at initial band insertion). Band erosion was detected in 2 patients, both requiring endoscopic retrieval (avoided through loose suturing of fundus to pouch). Band slippage occured in 3 patients, all requiring re-operation to re-site the band. (avoided using ‘Birmingham’ stitch technique). Oesphageal dilatation was detected in 3 patients, all requiring unbuckling of band (avoided by preventing over-inflation). Conclusions: The overall complication rate (33.8%) is inline with other series. Band-related complications can be prevented if appropriate measures are taken to avoid them.